This bad-boy rap is essentially why the otherwise non-diet-denting crepe needs to hang out with a less notorious crowd now and then. Actually, having said all that, making this pair fit into a day of healthy eating seems like it should have been an issue. 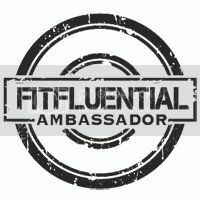 Have we ever talked about the principle of moderation? Yeah, I know, I could put anything out there and say, only eat two bites and you’ll be fine – but that’s not what I mean. 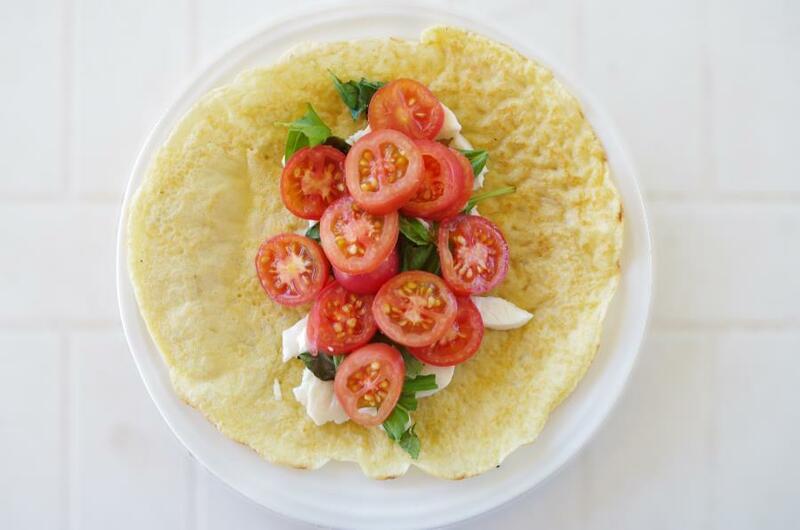 The reason this recipe works is that it has ALL the flavor and cheesy-tomatoey-crepey goodness goin’ on, but we engineer the quantities to get tastiness and not heaviness. Capish? It’s because I like crepes, I like Caprese, and I like you. I want us to be able to enjoy this delicious treat – like, 2 or 3 times over! 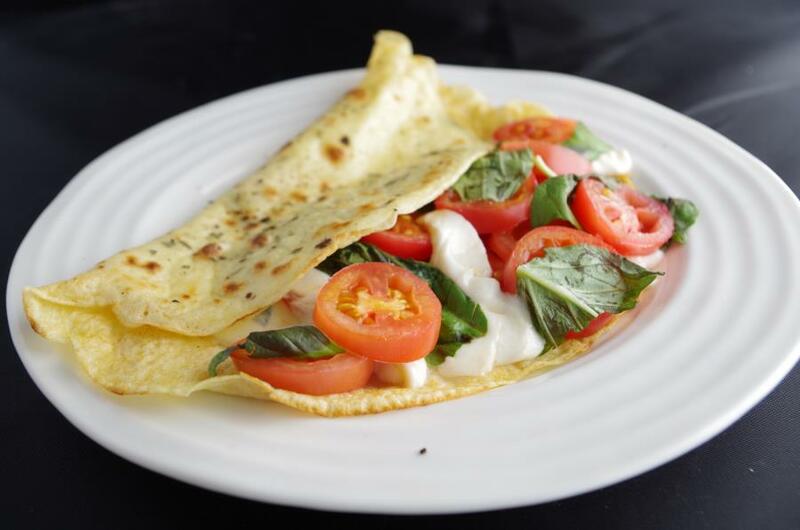 If we allow one delicious ounce of fresh mozzarella per 60-80 calorie crepe, ramp up the juicy cherry tomato action, and go wild with zesty ingredients like basil, balsamic vinegar, garlic, and pepper, we get a crazygood dish. Apparently, crazygood is my flamboyant new word. (What is my vocabulary coming to these days?) Factor in about 330 calories for two or 500 for three. Heat a small non-stick sauté pan on the stove over medium high heat and spray with a canola or vegetable oil cooking spray. Sprinkle a bit of the Herbs de Provence or oregano evenly across the pan. In the hot pan, briefly sauté the cherry tomatoes in a spritz of olive oil cooking spray and a pinch of salt, pepper, and garlic, just until heated and you can just start to smell cooking tomatoes. 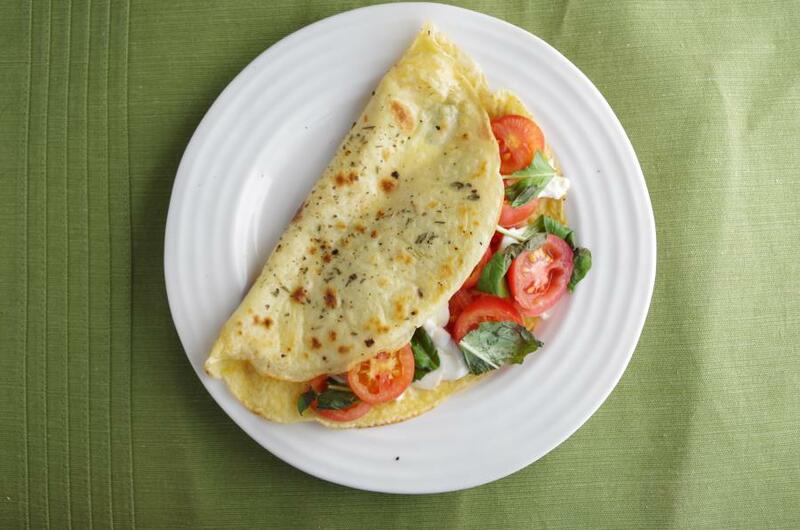 Divide ingredients among crepes, roll each one up, microwave about 10-15 seconds, just until the cheese begins to melt, and serve it up hot with a drizzle of balsamic and a sprinkle of salt and pepper each!